A few years ago Nick Dittmeier was in a band called Slithering Beast and he contacted me to review their debut album. Being the nice guy I am I agreed; but advised him that I would be ‘honest’ in my appraisal. That album was surprisingly good and not as ‘Rocky’ as the band name suggested. Sadly fame and fortune passed the band by and Dittmeier is now touring the Southern states under his own name with a band in tow and following a solo album last year they have now recorded their first band album;and a damn fine piece of work it is too. The track that first stood out was Die and Go To Shively which has the casual attitude of a Band track or possibly Levon Helm’s solo work; with Dittmeier having a much sweeter voice. The theme behind My Grey Suit is a bit different from the norm, with Dittmeier looking back to the time his father died and the effect buying his first suit and reading the eulogy had on him. Plus the track has some mighty fine guitar playing throughout. By the time I got to Simple as a Nod I’d stopped thinking of LIGHT OF DAY as an Alt. Country album as this song is as good as anything coming out of Music Row and could easily have found its way onto the Nashville TV series soundtrack; if it had been sung by Gunner or the other one. Dittmeier switches back to his acoustic guitar for Songs the House Makes which ends the short album; and yet again the banjo led song nods towards The Band; especially when he name checks Levon and Ophelia. 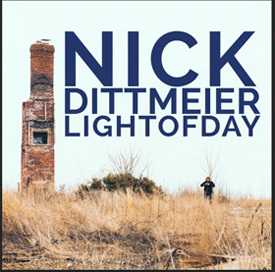 There are a currently lot of less qualified bands achieving a lot more success than Nick Dittmeier ; but the quality of his song-writing and the class of his band will see him through the dark days and into the light sooner than he expects.